The first more or less accurate map of the Caspian Sea prepared by K.Verden and F.Soymonov on the basis of their research (1719-1720) and the expeditions by E.Meyer (1699), A.Bekovich-Cherkassky (1715), N.Kozhin and V.Urusov (1716) was published in Paris. All the expeditions were organized by Peter the Great, who, according to Academician L.Berg, launched scientific hydrographic research. The atlas (made up of 8 maps) and the description of the Caspian Sea (its first sailing directions) prepared by F.Soymonov were published. These materials were used for more than 50 years until the sailing directions were republished. These materials were prepared on the basis of the data of the expedition headed by F.Soymonov in May – November 1726 on two ships Tsaritsyn and Astrakhan. I.Lerkhe, a military doctor, first carried out hydrometeorological observations (air temperature and atmospheric pressure) in Astrakhan, Baku, Derbent, Nizovaya Pristan and in the Sulak estuary. A.Nagaev held hydrographic research in some areas of the Caspian Sea. In 1760 the Senate commissioned A.Nagaev to compile a general map of the Caspian Sea which was published only in 1794 after his death. A hydrographic expedition led by I.Tokmachev and M.Ladyzhensky was held with the participation of I.Panin and N.Matveev. I.Nogatkin made a general map of the Caspian Sea taking into account the new data. Academicians P.Pallas and C.Gmelin led the first expeditions of the Academy of Science in the Caspian Sea and made a hypothesis on the dependence of sea level fluctuations on climate change. P.Pallas supposed that the Caspian Sea level was by 20 metres lower than the Black Sea level. Academician S.Gmelin died in July 1774 captured by the Kaytag leader. The tomb of the scientist who sacrificed his life for the sake of science is located in Kayakent village. Academician S.Gmelin can be considered the first Caspian ecologist as alongside with the description of the Caspian flora and fauna he made an assumption that the bitter taste of the Caspian water can be explained by oil pollution. The expedition led by M.Voynovich was held, where he described sea level fluctuations caused by up and down surge and made an assumption on the existence of oil deposits in the sea subsoil. The marine agency organized a permanent gauge post in the Volga river in Astrakhan to observe water level and ice phenomena. The observations data were published in the local Astrakhan news bulletins. The post operated, with some interruptions, until 1876. L. Golenishchev – Kutuzov led the preparation and publication of the best for the time being atlas of the Caspian Sea. A.Kolodkin held a vast instrumental hydrographic research of the Caspian Sea, prepared and published the Atlas of the Caspian Sea on 17 pages in 1826. The maps in the atlas are close to modern maps in their accuracy. Officers of the navigator corps launched regular meteorological observations in Astrakhan. Academician E.Lents was sent on a mission to Baku to study the fluctuations of the Caspian Sea level. The barometric approach helped to determine that the level of the Caspian Sea is by 30.5 metres lower than that of the Black Sea. The marine bathometer invented by E.Lents and E.Parrot was used in the Caspian for the first time to sample water from certain sea depth. By Lents’s petition, Baku customs office was instructed to organize systematic instrumental observations of the Caspian Sea level, which started on 1 February 1837. A little later (in 1853) observations were launched in Astrabad (Gorgan) Bay. G.Karelin held first survey of Kara-Bogaz-Gol Bay discovered by A.Bekovich – Cherkassky. This research put an end to the idea of this bay as of bottomless depths and showed that sea water flows to the bay due to increased water evaporation as compared to the sea. A complete hydrographic description of the bay was made in 1847 by I.Zherebtsov. Regular hydrometeorological observations were organized in Derbent, Lenkoran, Baku, Port-Petrovsk (Makhachkala) and at floating beacons (Chetyrekhbugorny, Chechensky, Apsheronsky etc.). Academician K.Baer was commissioned to the Caspian Sea to study its fishing resources and the reasons for their depletion. K.Baer, alongside with recommendations on improvement of fishing, made the first chemical analysis of the Caspian water and described emission of oil into the water. Wide expedition research led by N.Ivashentsev (1857-1867) and N.Pushchin (1871 -1874) was carried out. Its aim was to provide a comprehensive and complete description of the Caspian Sea. Main results of the first stage of the expedition research were summarized in the two-volume monograph “Hydrographic survey of the Caspian Sea…” (Volume 1 was published in 1866, Volume 2 – in 1870). Throughout 1860 – 1872 26 maps, 10 plans and sailing directions (including wind charts of Astrakhan, Baku and Ashuradeh Island) were published on the basis of this survey and later were republished in 1897. The Atlas of the Caspian Sea was published in 1877. On the basis of the second research stage N.Pushchin prepared and published papers “Magnetic observations in the Caspian Sea” (1874) and “Caspian Sea: hydrographic description and sailing directions (1877). The description contains the first chart of the Caspian currents made by N.Pushchin. The first stage of research involved A.Ulsky who constructed a sounding apparatus which made it possible to measure sea depth to 900 m and sample seabed. A.Ulsky made up the first bathymetric chart of the Caspian Sea (for the Absheron Threshold). The Volga group of the Department for roads and waterways performed coupling of the Volga delta to the state leveling network. The reference mark of the sea level as compared to the Baltic Sea was made on the wall of Astrakhan Kremlin. The same year, this group organized Astrakhan water gauge post in the point of branching of Kutum channel from the Volga River. This post has provided the continuous data series on the water level fluctuations since 1881 to the present time. At the same time a water gauge post was established at the outflow of the Bakhtemir Channel into the Caspian Sea. Later, in 1892 a hydrometeorological station was organized in Biryuchya Kosa village to ensure navigation in the Volga-Caspian Canal. In 1887-1890 the Volga group made 140 measurements of water discharge in the Volga delta by means of hydrometric propellers. A complex expedition survey of Kara-Bogaz-Gol Bay was carried out with the participation of hydrologist I.Shpindler, zoologist A.Ostroumov, chemist A.Lebedintsev and geologist N.Andrusov. Within this survey a chemical analysis of the Caspian water and water in the Bay was made. I.Shpindler described and explained the reasons for deepwater upwelling at the eastern and western coasts of the Middle Caspian. Instrumental observations of the Caspian Sea level started in Port-Petrovsk (Makhachkala) and at the eastern coast of the sea (in Kuuli-mayak). A bit later (in 1915) observations started in Krasnovodsk (Turkmenbashi). Complex research (hydrological, hydrochemical and hydrobiological) of the Caspian Sea led by N.Knipovich was implemented. The research specified the scheme of currents and offered the scheme of vertical water circulation in the Middle and South Caspian, determined horizontal and vertical distribution of water temperature and salinity, the content of dissolved oxygen and revealed the pollution of the sea bottom with hydrogen sulphide. N.M.Knipovich summarized the research results in his monograph “Hydrological research in the Caspian Sea in 1914-1915” published in 1921. To improve navigation in the Volga delta V.Valedinsky and B.Apollov held a complex research of hydrological regime of the western branches (Bakhtemir and Kamyzyak) and the marine estuarine zone. The restoration and development of the network of marine hydrometeorological stations and posts in the Caspian Sea started. The process was aided by the establishment of Meteorological Service in the RSFSR (1921), the joining of Hydrological and Meteorological Services of the USSR 1929), the establishment of the Chief Department for Hydrometeorological Service by the Council of People’s Commissars of the USSR (1936). Throughout the Civil war (1918 – 1920) only one station operated in Makhachkala; in 1921 observations were carried out at 13 points. Since the early 30s till the moment the number of stations and posts in the Caspian Sea has varied from 30 to 50, which can partly be explained by sea level fluctuations which peak-to-peak value in the XXth century exceeded 3 metres (some observation points were closed as a result of flooding or draining of the coast in their location sites). The Department for Navigation Safety in the Caspian Sea established Baku Marine Observatory, which became the basis for activities on marine meteorology, climatology, hydrology and magnetism. Hydrological research in the South Caspian along the route Baku – Krasnovodsk – Ashuradeh – Astara – Baku was held four times a year (February, May, August, November) in accordance with the recommendations of the International Sea Research Council established in 1902. The study of the upper layers of atmosphere with help of weather balloons started in Guryev (Atyrau) and Makhachkala with the assistance of the Main Geophysical Observatory (MGO). Observation results were telegraphed to the MGO. The Commission of the Academy of Sciences on Complex Research of the Caspian Sea was established and actively operated. Its main objective was to solve the tasks on the all-round hydrological and biological research of the Caspian Sea and the study of the Caspian water balance as a result of possible fall of the sea level. S.Bruyevich organized and held the first in the Soviet period complex oceanographic survey of the whole sea water area. Later by VNIRO initiative the surveys were held regularly at 4-5 cross-sections until 1943. The research results were published in “Papers on the complex study of the Caspian Sea” (1937-1941), where we would note Bruyevich’s monograph “Hydrochjemistry of the Middle and South Caspian” (issue 4, 1937), B.Zaikovs “Long-term fluctuations of the Volga runoff and the Caspian Sea level” (issue 10, 1940), “Materials on the water balance of the Caspian Sea” (issue 12, 1941) and “Elements of the chemical balance of the Caspian Sea” (issue 14, 1941). A month-long field experiment was held at the western coast of the Middle Caspian. It included measuring currents, temperatures and other parameters from two anchored ships. N.Gorsky (1934) and B.Apollov (1938-1939) held expedition research of ice conditions in the North Caspian and their impact on navigation in the Volga – Caspian Canal. Volume 2 of “Hydrological reference book of the USSR” devoted to the Caspian Sea (Issue 1 and 2) was published. Hydrometeorological service started issuing and distributing marine hydrometeorological forecasts for the main Caspian ports. “Currents of the Caspian Sea (a guidebook for navigators)” (1942) and V.Lednev’s monograph “Currents of the North and Middle Caspian” (1943) were published. The State Oceanographic Institute (SOI) was established. It is a leading hydrometeorological institution studying hydrometeorological regime of oceans, seas and river estuaries, which made a great contribution to the study of the Caspian Sea. In 1995 Caspian Marine Scientific Research Centre (KaspMNIZ) was established on the basis of SOI expeditionary group. “Oceanographic charts for the Caspian Sea” (1949) and “Oceanographic charts for the Caspian, the Aral and the Azov Seas” (1949) still used at the moment were compiled and published. Special stations to study hydrometeorological characteristics of the river estuaries were established (the Volga – 1951, the Kura – 1960 and the Terek – Sulak – 1970). Hydrometeorological service was commissioned to study the hydrometeorological regime of the oil and gas bearing water areas. For this purpose a special hydrometeorological station was established at Oil Rocks as well as a set of posts and stations in the oilfields of Absheron and Dagestan coasts. Hydrometeorological observatories were organized in Astrakhan (as part of the North-Caucasian HMS), in Baku and Makhachkala (as part of Azerbaijani HMS), which were later (in the 80s) reorganized into the cenres on hydrometeorology and environmental monitoring. “A climatic and hydrological atlas of the Caspian Sea” (1955), «The Atlas of the Caspian Sea Ice (1961), “Complex hydrometeorological atlases of the Caspian and the Aral Seas” (1963 ) and the “Atlas of winds and waves of the Middle and the South Caspian” (1968) were published. The monographs on the hydrology of the Volga delta (S.Baidin et al. 1956) and its estuary (N.Skriptunov, 1958) were published. 10 “secular” stations and 8 “secular” cross-sections for the study of long-term and seasonal variability of the Caspian Sea hydrological regime were organized in accordance with the “Statute on “secular” observations of the seas adopted in 1961. These observations data were published in “Marine hydrometeorological monthlies” (till 1975) and “Annual data on regime and quality of marine and estuarine water” (since 1976). The unified post zero (-28.00 m B.S.) was introduced for all the posts observing the sea level. Four of them (Makhachkala, Fort-Shevchenko, Baku, Krasnovodsk) were selected as “secular” ones. All the available data on the sea level were systemized and summarized in the “Catalogue of level observations” published in 1963. Monographs on the hydrology of the Volga delta (S.Baidin, 1962) and the Terek delta (I.Belyaev, 1963) were published. Astrakhan Hydrometeorological Observatory prepared and published “Collection of materials of hydrological observations in the Volga delta”, which comprised observations data at 45 hydrological posts for the whole period of their existence to 1961. The monograph “Hydrochemistry of the Caspian Sea” by A.Pakhomova and B.Zatuchnaya was published. Observation of marine pollution started in the coastal areas and the open part of the Caspian Sea. Observations became systematic after the establishment of the State Service of observations and control of environmental pollution (1972), adoption of the 1st stage of the Service (1977); the establishment of complex laboratories for the control of environmental pollution (in Astrakhan and Makhachkala) and the Centre for Study and Control of Environmental Pollution (in Baku). Observations data of the Caspian Sea pollution were published in the “Yearbooks of marine water quality”. The Academic Council on the complex study of the Caspian Sea problems of the Academy of Science was established. It worked until 1992 (throughout 1973 – 1991 it operated as the Academic Council of the USSR State Committee on the complex study of the Caspian Sea problems. Moscow State University published the monograph “The Caspian Sea” (Edited by A.Dobrovolsky, A.Kosarev, O.Leontyev). Monographs on hydrology of the estuaries of the Kura River (edited by I.Baidin), the Terek and the Sulak Rivers (S.Baidin et al.) were published. Volume 2 of the “Reference book on hydrological regime of the USSR seas and river estuaries” devoted to the Caspian Sea was published. Issue 1 “Northern part of the Caspian Sea” was published by the North-Caucasus HMS, Issue 2 “Middle and southern part of the Caspian Sea” – by Azerbaijani HMS. The following monographs were published: “Radiation balance of the Caspian Sea” by R.Reifman, “Hydrology of the Caspian and the Aral Seas” by A.Kosarev, “Regime characteristics of strong winds at the USSR seas. Part 1. Caspian Sea” by S.Koshinsky. Interagency research expeditions in the Caspian Sea were organized and held by hudrometeorological organizations, hydrographic service, the Academy of Science and Moscow State University. The research results were published in the series of research papers, including the monograph “Caspian Sea. Hydrology and hydrochemistry” published in 1986. Azerbaijani Department for hydrometeorology and environmental control organized regular aerial surveys of oil and gas bearing water areas of Azerbaijan and Turkmenistan with help of SOI Leningrad Branch. A scientific reference book “Hydrometeorological conditions of the USSR sea shelf areas” V.2 “Caspian Sea” was prepared and published under the supervision of SOI (Editor-in-chief F.Terziev). Monographs “Marine hydrometeorology and hydrochemistry, v.6. “Caspian Sea”, issue 1 “Hydrometeorological conditions” (1992), issue 2 “Hydrochemical conditions and oceanological basis for forming bioproductivity (1996)” were prepared and published within the framework of the project “Seas” under the supervision of SOI (Editor-in-chief F.Terziev). Hydrometeorological organizations of the Caspian littoral states with the support of the World Meteorological Organizations established Coordinating Committee on Hydrometeorology and Pollution Monitoring of the Caspian Sea (CASPCOM). The monograph by A.Kosarev and V.Tuzhilkin “Climatic thermohaline fields of the Caspian Sea” prepared by MSU jointly with SOI was published. The monograph is based on the data of 65 thousand ship observations since 1925. Oil and gas companies operating in the Russian subsoil sector of the Caspian Sea joined complex environmental research and environmental monitoring of the Caspian Sea. The monograph “The Volga estuary: Hydrological and morphological processes, regime of pollutants and the impact of the Caspian Sea level fluctuations” (edited by V.Polonsky, V.Mikhailov and S.Kiryanov) was published. The collection of research papers “Hydrometeorological aspects of the Caspian Sea and its basin” prepared by SOI jointly with the State Hydrological Institute was published. The following papers were published: the monograph by G.Panin, R.Mamedov and I.Mitrofanov “Current state of the Caspian Sea” prepared by RAS Institute of Water Problems, the monograph by S.Lebedev and A.Kostyanoy “Satellite altimetry of the Caspian Sea” prepared by RAS Institute of Oceanology and the monograph «The Caspian Sea Environment» prepared by authors from MSU, SOI and RAS IO and published by Springer Publishers. On the basis of long-term observations of marine water pollution KaspMNIZ prepared and issued the atlases “Environmental assessment of pollution of the western part of the North Caspian with oil hydrocarbons” and “Environmental assessment of pollution of the western part of the Middle Caspian with oil hydrocarbons” The Azerbaijan National Academy of Science prepared and published the monograph by A.Mehtiev and A.Gyul “Anthropogenic pollution of the Caspian Sea”. 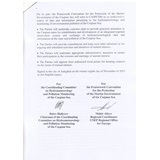 Two scientific monographs were published: “Caspian Sea: extreme hydrological phenomena” (RAS Institute of Water Problems) by M.Bolgov, G.Krasnozhon and A.Lubushkin and “Hydrometeorological variability and eco-geographic problems of the Caspian Sea’ (Institute of Geography of the Azerbaijan National Academy of Science) by R.Mamedov. The following electronic information resources have been developed and put into operation within the Unified System of Information on the Situation in the World Ocean (ESIMO): electronic reference book on the Caspian Sea (developed by SOI), electronic atlas “Climate of the Russian Seas and the World Ocean” including the section devoted to the Caspian Sea (developed by RIHMI), ESIMO operative module containing daily updated actual and forecasted information on hydrometeorological conditions of the Caspian Sea (developed by Hydrometeorological Centre of Russia). In 2012 SOI created, registered and placed in the Internet the electronic database “Hydrochemical conditions and pollution of the RF seas” which contains the information on the state of the observations network at the Caspian Sea and the data of the state monitoring. By CASPCOM initiative an international scientific conference “Climate and water balance changes in the Caspian region” was held in Astrakhan. The publication of CASPCOM information and analytical bulletin on the state of the Caspian Sea level started. “General catalogue of the Caspian Sea level” was prepared through joint efforts of hydrometeorological organizations of the Caspian littoral states. CASPCOM was established in 1994 by national hydrometeorological agencies (NMHSs) of the Caspian littoral states (Azerbaijan, Iran, Kazakhstan, Russia and Turkmenistan) with the support of the World Meteorological Organization (WMO). 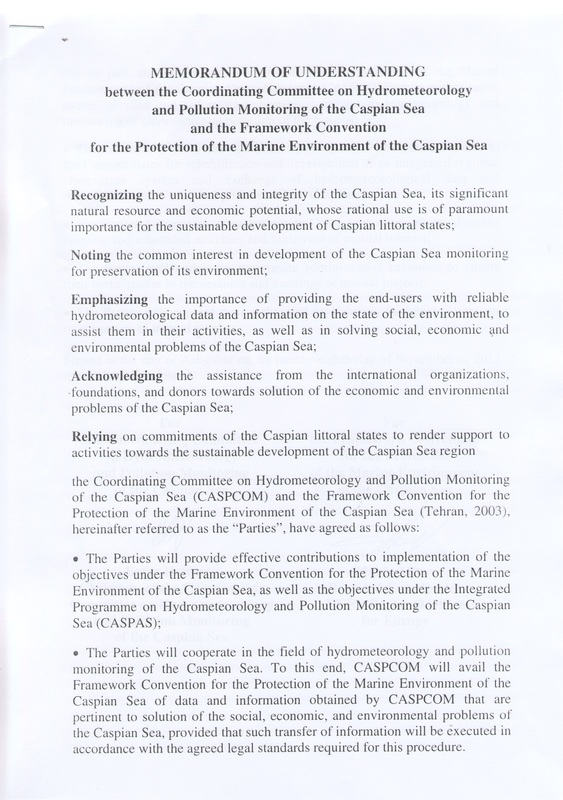 The Statute adopted by the parties in 1994 indicates that CASPCOM was established with a view to co-ordinating, standardizing, cooperating in and improving in the fields of hydrometeorology and pollution monitoring of the Caspian Sea. - joint action in matters of training specialists, conducting of research, conferences, meetings and workshops on hydrometeorology and pollution monitoring of the Caspian Sea. It is also determined that CASPCOM sessions take place once a year, and the attendance of 4 parties constitutes a quorum. Chairman and Vice Chairman are elected for a two-year period, the rotation of management bodies and session hosting states is performed in alphabetical order. Draft Agreement on cooperation of the Caspian states in the field of hydrometeorology of the Caspian Sea was prepared through joint efforts of NMHSs- CASPCOM participants. This Agreement is expected to be signed in the nearest future. The main objective of this Agreement is to establish and develop a regional system for obtaining and exchanging information on the state of the Caspian Sea, in order to ensure safety of lives and facilitate economic activities in the sea. In 1997 CASPCOM adopted the "Integrated Programme on Hydrometeorology and Environmental Monitoring in the Caspian Sea Region" (CASPAS) prepared with the support of WMO and aimed at assisting in the establishment of the regional system of monitoring and information exchange. This was when CASPAS Coordinator was appointed. First CASPAS Programme was a large-scale one and relied mainly on international financial assistance. Then it was split into separate projects which could be implemented by NMHSs on their own as they have invested sufficient funds in updating of observation networks and information systems in the recent time. The joint activities of NMHSs in the field of hydrometeorology of the Caspian Sea are based on the real-time data exchange via WMO Global Telecommunication Network. Moreover, several CASPCOM projects have been implemented through joint efforts, such as the "General Data Catalogue of the Caspian Sea Level" covering the whole observation period starting from 1900. In 2006 CASPCOM Working Group was established, which alongside with CASPAS Coordinator, makes up CASPCOM working bodies. In 2010 CASPCOM organized and held the first international scientific conference , devoted to changes of climate and water balance of the Caspian Sea in Astrakhan (Russia). 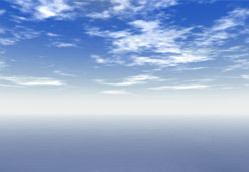 World Meteorological Organization is CASPCOM long-standing partner. According to the Recommendations of the 17th Session (Astana, the Republic of Kazakhstan, 16-17 October 2012) the Working Group has prepared CASPCOM poster and booklet to be demonstrated at the WMO Regional Associations meetings. Currently CASPCOM gives much attention to extending cooperation with the Framework convention for the protection of the marine environment of the Caspian Sea signed in Teheran in November 2003. For this purpose CASPCOM has prepared a report "Assessment of CASPCOM potential contribution to the process of the Tehran Convention implementation" and is planning a number of projects on the impact assessment of weather and climate changes on the state of the Caspian Sea environment. 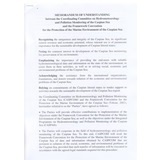 The Memorandum of Understanding between CASPCOM and the Tehran Convention was signed at the 18th CASPCOM Session on November 28, 2013 (the text of the Memorandum) by CASPCOM Chairman, Mr.B.Halliyev and UNEP Regional Coordinator Mr. M.Aliyev, representing the Interim Secretariat of the Tehran Convention (photo). 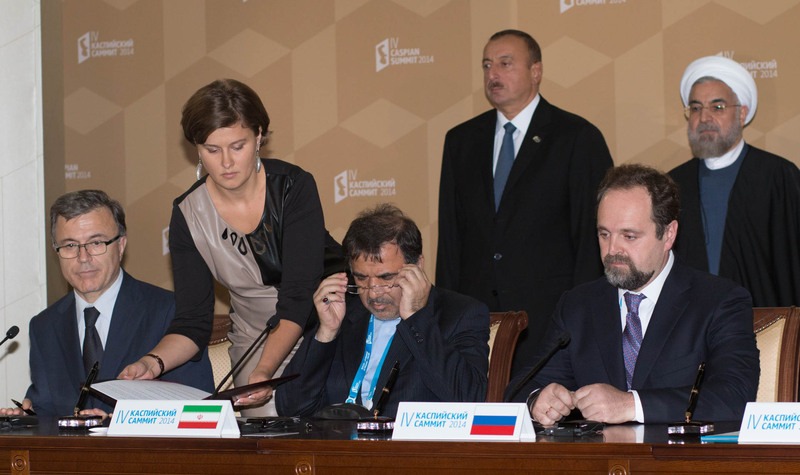 On September, 29, 2014, the intergovernmental Agreement on Cooperation in the Field of Hydrometeorology of the Caspian States, prepared through joint efforts of NMHSs –CASPCOM members, was signed in Astrakhan within the framework of the 4th Caspian Summit, which was attended by leaders of all the Caspian littoral states. The Agreement on Cooperation in the Field of Hydrometeorology of the Caspian States was signed by: Mr. Guseingulu Bagirov, Minister of Ecology and Natural Resources of Azerbaijan; Mr. Abbas Ahmad Akhoundi, Minister of Roads and Urban Development of the I.R. of Iran; Mr. Vladimir Shkolnik, Minister of Energy of Kazakhstan; Mr. Sergey Donskoy, Minister of Natural Resources and Environment of the Russian Federation; and Chairman of Hydrometeorological Committee under the Cabinet of Ministers of Turkmenistan, Mr.Batyr Halliyev (photo). The Agreement on Co-operation in the Field of hydrometeorology of the Caspian Sea entered into force on 31 January 2016. 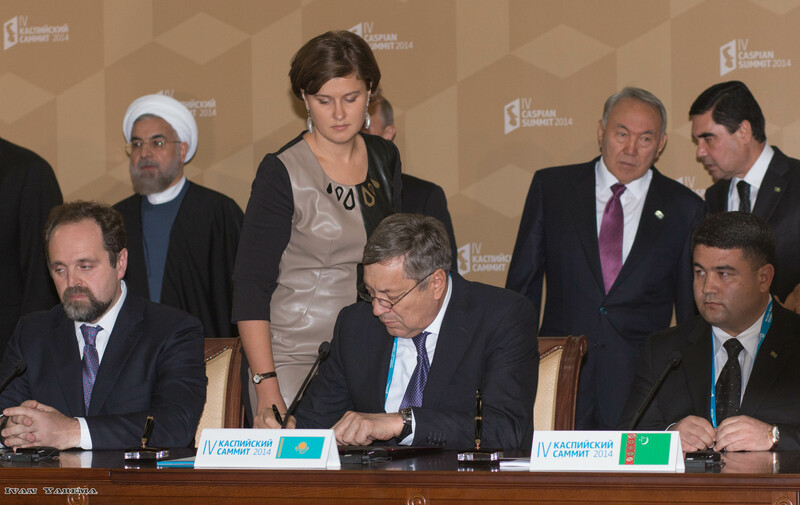 It was signed at the Summit of the Caspian Littoral States on 29 September 2014. 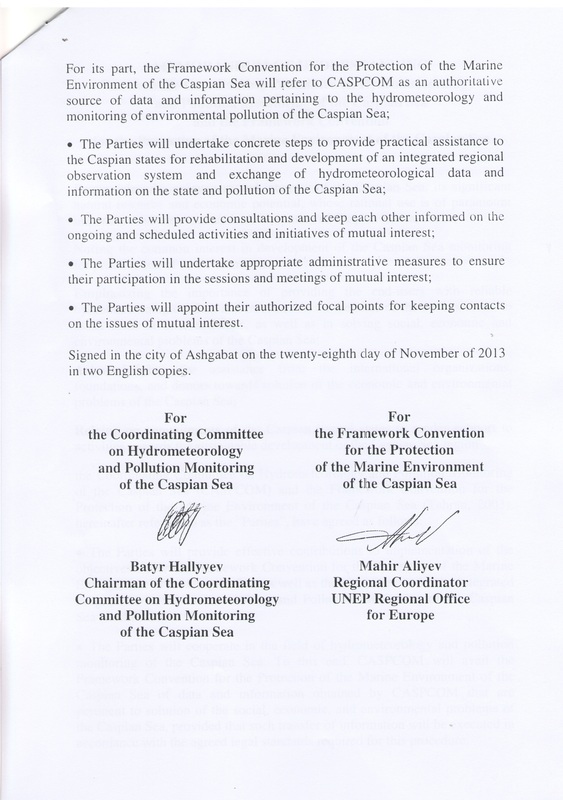 The entry into force of the Agreement on Co-operation and the elaboration and implementation of the stipulated Integrated Intergovernmental Programme on Hydrometeorology of the Caspian Sea opens new opportunities not only for information exchange, but also for the interaction in other fields of hydrometeorology ranging from carrying out of observations to forecasting of weather and climate. The final output of this co-operation is ensuring the safety of navigation and other activities in the water area and on the coast, which depend on changes of weather and climate. Everyone working in the Caspian Sea needs accurate hydrometeorological forecasts, timely storm alerts and the information required to design hydraulic structures. Alongside with this, hydrometeorological information is essential for environmental protection, conservation of Caspian Sea biodiversity and efficient use of its natural resources. 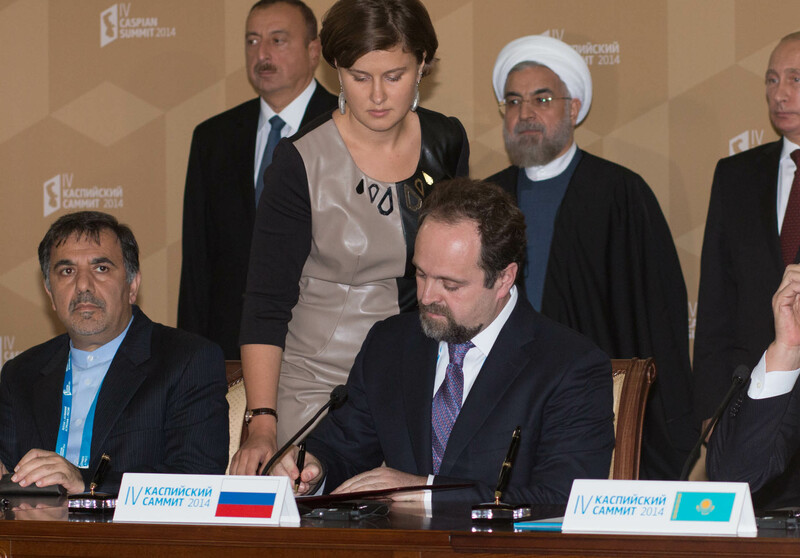 Now hydrometeorologists and ecologists will interact more closely: due to the signing of the Agreement there emerged a legal basis for the co-operation with the Tehran Convention on the Protection of the Marine Environment of the Caspian Sea. All in all, the entry into force of the Agreement means that CASPCOM motto “Co-operation in the field of meteorology for mutual security and benefit of the people and the sea” has received another impetus which might be the most important for its implementation.